“In the last several years, 3D printing with plastics has advanced rapidly. 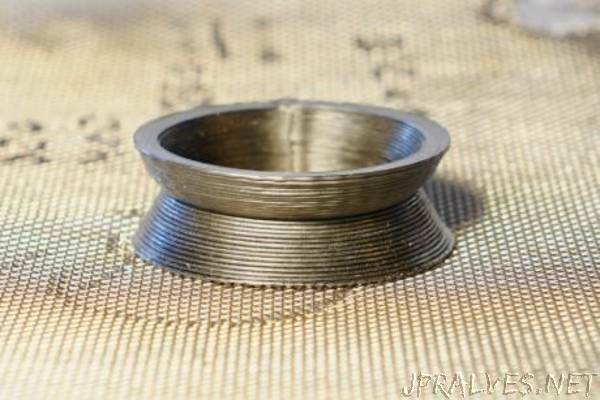 Now, a team of researchers have shown that it may soon be as easy and practical to use metals with 3D printing. Led by Jan Schroers, Yale professor of mechanical engineering & materials science, the research team used a new approach to 3D print objects from metallic glass – a relatively new material stronger than even the best metals, but with the pliability of plastic. The results are published in Materials Today. Because metals generally don’t exist in a state that allows them to be readily extruded, 3D printing of metals is still challenging and limited. Bulk metallic glasses (BMGs), however, can undergo continuous softening upon heating, a phenomenon present in thermoplastics but not conventional metals. BMGs owe their properties to their unique atomic structures: when metallic glasses cool from a liquid to a solid, their atoms settle into a random arrangement and do not crystallize the way traditional metals do. The team, which also includes researchers from the company Desktop Metal Inc., and MIT, has shown that BMGs can be used in 3D printing to generate solid, high-strength metal components under ambient conditions similar to those in thermoplastic 3D printing. “It was even surprising to us how practical this process is once we had the processing conditions figured out,” Schroers said. Additive manufacturing of metal components has been done previously, using highly localized heating and solidification of powdered metal, and shaping it into the desired structure. The process, however, is costly and complicated - and often it doesn’t yield desirable properties. The researchers’ breakthrough greatly reduces the costs and resources involved by exploiting the softening behavior of BMGs. It could eliminate compromises in choosing thermoplastic components over metal components for a range of materials and engineering applications. The team has focused on a well-characterized and readily available BMG material made from zirconium, titanium, copper, nickel and beryllium. The team has also shown theoretically that a wider range of BMGs can be printed with this method. The researchers used amorphous rods of 1 millimeter diameter and of 700 mm length. An extrusion temperate of 460 degrees Celsius is used and an extrusion force of 10 to 1000 Newtons to force the softened fibers through a 0.5 mm diameter nozzle. When characterizing the printed BMG parts, the team was very surprised. “We expected high strength in the parallel-to-the-printing orientation, but were very surprised by the strength in the perpendicular orientation,” said Jittisa Ketkaew, a co-author and graduate student in the Schroers lab. Punnathat Bordeenithikasem, a co-author and recent graduate from Yale, said the ability to 3D print metallic parts with the same ease as thermoplastics will revolutionize the metal additive manufacturing field.